It took me a long time to find inspiration for this plate, which is funny because I absolutely adore the plate itself (which was found at, yep, you guessed it, the thrift store down the road). I think it was the edges that threw me off – I didn’t want the design to be too busy and compete with the shape of the plate. In the end, the idea for the design came from some random magazine clipping I had pasted in my Book of Inspiration. I’m not sure what kind of flower it is, but it kinda reminds me of a thistle. Or a sort of floral-inspired microphone. 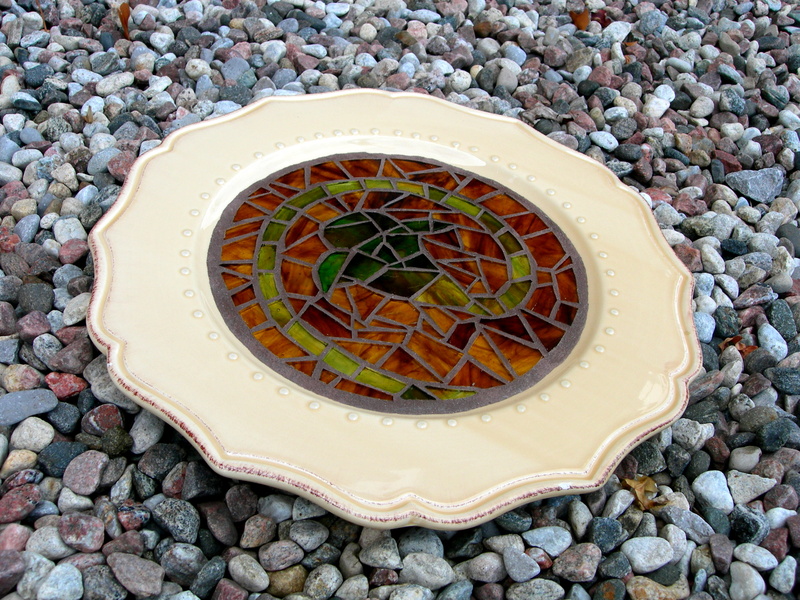 This plate was one of the ones snapped up at the Sandy Hill craft sale a few months ago. It was bought by a lovely couple as a Christmas gift for their daughter. I think it’s kind of fun to imagine the ‘lives’ of my mosaics after they leave my hands. Did she like it? Where did she put it? Is it being used to hold keys or candles or yummy little candies, or is it being displayed like art?